The late writer Michael McDowell is best known these days, if at all, for co-writing the screenplay to BEETLEJUICE, which led to further film work in the nineties. But during the eighties, he cranked out a number of pulpy horror novels, including the then ubiquitous “Blackwater” series. Early in his career he wrote the novel ‘Cold Moon Over Babylon’, published as a paperback original in 1980. 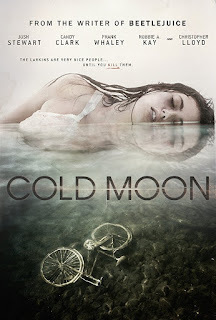 That novel has now been adapted into the film COLD MOON by director Griff Furst and his co-writer, Jack Snyder. At first, COLD MOON plays like a fairly typical seventies gothic slasher movie, something along the lines of BLOOD AND LACE or THE TOWN THAT DREADED SUNDOWN, perhaps. That means unlike a FRIDAY THE 13TH eighties style slasher, there’s more emphasis on character, place, and subtext. We sense there will be a little more meat on its cinematic bones than just seeing how high a body count the killer can rack up, and what interesting forms the deaths might take. The focus is initially on the Larkin family – matriarch Evelyn (Candy Clark and her two grandchildren, sixteen year old Margaret (Sara Catherine Bellamy) and Jerry (Chester Rushing), her older, more responsible brother). Things are already tough, with the family well behind on their mortgage. And then a mysterious masked man savagely murders Margaret. As Sheriff Ted Hale goes about investigating the homicide, we are introduced to the rest of the major players: narcissistic rich kid Nathan Redfield (Josh Stewart) and his cartoonishly trashy girlfriend (also the Sheriff’s daughter) Belinda (Rachele Brooke Smith), Nathan’s hapless younger brother ((Robbie A. Kay) ) and mean-spirited, wheelchair-bound dad (Christopher Lloyd), and Margeret’s teacher (Marcus Lyle Brown), a possible suspect in her killing. And then, about 30 minutes in, the film takes a shocking turn. Not only do we find out that who we thought would be the main characters aren’t, we move from slasher to supernatural revenge flick. Of the plot, I can say no more without spoiling the fun. And while COLD MOON may not be a perfect film, it is fun. Director Furst doesn’t have a whole lot of visual flair, but he delivers solid meat and potatoes filmmaking here. The cast is good, although the aforementioned campy portrayal of Belinda by Rachele Brooke Smith doesn’t quite fit the tone. There are also some cheap looking CGI effects that make one wish this had been made during the seventies or eighties, but nothing so bad as to ruin the movie. Okay, maybe the cameo by the Beetlejuice-headed snake in one scene comes close. Nonetheless, COLD MOON turns out to be a mostly satisfying affair. It feels contemporary enough that modern audiences should be okay with it, but I imagine fans of drive-in era horror will appreciate it more. 3 out of 4 stars.